This week, Hugo speaks with Sean Law about data science research and development at TD Ameritrade. Sean’s work on the Exploration team uses cutting edge theories and tools to build proofs of concept. At TD Ameritrade they think about a wide array of questions from conversational agents that can help customers quickly get to information that they need and going beyond chatbots. They use modern time series analysis and more advanced techniques like recurrent neural networks to predict the next time a customer might call and what they might be calling about, as well as helping investors leverage alternative data sets and make more informed decisions. What does this proof of concept work on the edge of data science look like at TD Ameritrade and how does it differ from building prototypes and products? And How does exploration differ from production? Stick around to find out. This week, Hugo speaks with Debbie Berebichez about the importance of critical thinking in data science. Debbie is a physicist, TV host and data scientist and is currently the Chief Data Scientist at Metis in NY. In a world and a professional space plagued by buzz terms like AI, big data, deep learning, and neural networks, conversations around skill sets and less than productive programming language wars, what has happened to critical thinking in data science and data thinking in general? What type of critical thinking skills are even necessary as data science, AI and machine learning become even more present in all of our lives and how spread out do they need to be across organizations and society? Listen to find out! This week, Hugo will be speaking with Skipper Seabold about the current and looming credibility crisis in data science. Skipper is Director of Data Science at Civis Analytics, a data science technology and solutions company, and also the creator of the statsmodels package for statistical modeling and computing in python. Skipper is also a data scientist with a beard bigger than Hugo's. They’re going to be talking about how data science is facing a credibility crisis that is manifesting itself in different ways in different industries, how and why expectations aren’t met and many stakeholders are disillusioned. You’ll see that if the crisis isn’t prevented, the data science labor market may cease to be a seller’s market and we’ll have big missed opportunities. But this isn’t an episode of Black Mirror so they’ll also discuss how to avoid the crisis, taking detours through the role of randomized control trials in data science, the rise of methods borrowed from econometrics and how to set realistic expectations around what data science can and can’t do. This week, Hugo speaks with Noemi Derzsy, a Senior Inventive Scientist at AT&T Labs within the Data Science and AI Research organization, where she does lots of science with lots of data. They’ll be talking about her work at AT&T Labs Research, the mission of which is to look beyond today’s technology solutions to invent disruptive technologies that meet future needs. AT&T Labs works on a multitude of projects, from product development at AT&T, to how to combat bias and fairness issues in targeted advertising and creating drones for cell tower inspection research that leverages AI, ML and video analytics. They’ll be talking about some of the work Noemi does, from characterizing human mobility from cellular network data to characterizing their mobile network to analyze how its topology compares to other real social networks reported to understanding tv viewership, and how engaged people are in different shows. They’ll discuss what the future of data science looks like, whether it will even be around in 2029 and what types of skills would help you land a job in a place like AT&T Labs. This week, Hugo speaks with Chris Albon about getting your first data science job. Chris is a Data Scientist at Devoted Health, where he uses data science and machine learning to help fix America's healthcare system. Chris is also doing a lot of hiring at Devoted and that’s why he’s so excited today to talk about how to get your first data science job. You may know Chris as co-host of the podcast Partially Derivative, from his educational resources such as his blog and machine learning flashcards or as one of the funniest data scientists on Twitter. This week, Hugo speaks with Reshama Shaikh, about women in machine learning and data science, inclusivity and diversity more generally and how being intentional in what you do is essential. Reshama, a freelance data scientist and statistician, is also an organizer of the meetup groups Women in Machine Learning & Data Science (otherwise known as WiMLDS) and PyLadies. She has organized WiMLDS for 4 years and is a Board Member. They’ll discuss her work at WiMLDS and what you can do to support and promote women and gender minorities in data science. They’ll also delve into why women are flourishing in the R community but lagging in Python and discuss more generally how NUMFOCUS thinks about diversity and inclusion, including their code of conduct. All this and more. To start a WiMLDS chapter: email info@wimlds.org and more info at our starter kit. WiMLDS Paris: They run their meetups in English, so knowledge of French is not required. This week, Hugo speaks with Marco Blume, Trading Director at Pinnacle Sports. Marco and Hugo will talk about the role of data science in large-scale bets and bookmaking, how Marco is training an army of data scientists and much more. At Pinnacle, Marco uses tight risk-management built on cutting-edge models to provide bets not only on sports but on questions such as who will be the next pope? Who will be the world hot dog eating champion, who will land on mars first and who will be on the iron throne at the end of game of thrones. They’ll discuss the relations between risk management and uncertainty, how great forecasters are necessarily good at updating their predictions in the light of new data and evidence, how you can model this using Bayesian inference and the future of biometric sensing in sports betting. And, as always, much, much more. This week on DataFramed, the DataCamp podcast, Hugo speaks with Gabriel Straub, the Head of Data Science and Architecture at the BBC, where his role is to help make the organization more data informed and to make it easier for product teams to build data and machine learning powered products. They’ll be talking about data science and machine learning at the BBC and how they can impact content discoverability, understanding content, putting the right stuff in front of people, how Gabriel and his team develop broader data science & machine learning architecture to make sure best practices are adopted and what it means to apply machine learning in a sensible way. How does the BBC think about incorporating data science into its business, which has been around since 1922 and historically been at the forefront of technological innovation such as in radio and television? Listen to find out! This week Hugo speaks with Dr. Brandeis Marshall, about people of color and under-represented groups in data science. They’ll talk about the biggest barriers to entry for people of color, initiatives that currently exist and what we as a community can do to be as diverse and inclusive as possible. Brandeis is an Associate Professor of Computer Science at Spelman College. Her interdisciplinary research lies in the areas of information retrieval, data science, and social media. Other research includes the BlackTwitter Project, which blends data analytics, social impact and race as a lens to understanding cultural sentiments. Brandeis is involved in a number of projects, workshops, and organizations that support data literacy and understanding, share best data practices and broaden participation in data science. Cathy O'Neil & Hanna Gunn's "Ethical Matrix" paper coming soon. Hugo speaks with Wes McKinney, creator of the pandas project for data analysis tools in Python and author of Python for Data Analysis, among many other things. Wes and Hugo talk about data science tool building, what it took to get pandas off the ground and how he approaches building “human interfaces to data” to make individuals more productive. On top of this, they’ll talk about the future of data science tooling, including the Apache arrow project and how it can facilitate this future, the importance of DataFrames that are portable between programming languages and building tools that facilitate data analysis work in the big data limit. Pandas initially arose from Wes noticing that people were nowhere near as productive as they could be due to lack of tooling & the projects he’s working on today, which they’ll discuss, arise from the same place and present a bold vision for the future. pandas, an open source, BSD-licensed library providing high-performance, easy-to-use data structures and data analysis tools for the Python programming language. 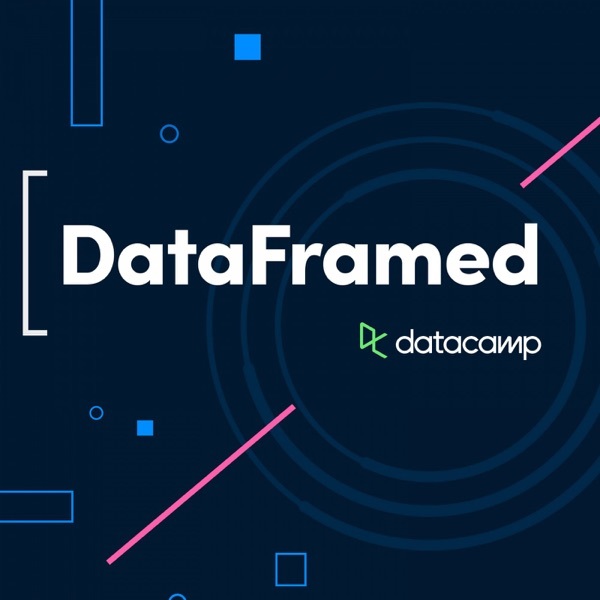 In this episode of DataFramed, the DataCamp podcast, Hugo speaks with Angela Bassa about managing data science teams. Angela is Director of Data Science at iRobot, where she leads the team through development of machine learning algorithms, sentiment analysis, and anomaly detection processes. iRobot are the makers of consumer robots that we all know and love, like the Roomba, and the Braava which are, respectively, a robotic vacuum cleaner and a robotic mop. Angela will talk about how to get into data science management, the most important strategies to ensure that your data science team delivers value to the organization, how to hire data scientists and key points to consider as your data science team grows over time, in addition to the types of trade-offs you need to make as a data science manager and how you make the right ones. Along the way, you’ll see why a former marine biologist has the skills and ways of thinking to be a super data scientist at a company like iRobot and you’ll also see the importance of throwing data analysis parties. Hugo speaks with Peter Bull about the importance of human-centered design in data science. Peter is a data scientist for social good and co-founder of Driven Data, a company that brings cutting-edge practices in data science and crowdsourcing to some of the world's biggest social challenges and the organizations taking them on, including machine learning competitions for social good. They’ll speak about the practice of considering how humans interact with data and data products and how important it is to consider them while designing your data projects. They’ll see how human-centered design provides a robust and reproducible framework for involving the end-user all through the data work, illuminated by examples such as DrivenData’s work in financial services and Mobile Money in Tanzania. Along the way, they’ll discuss the role of empathy in data science, the increasingly important conversation around data ethics and much, much more. If you liked this interview, you might be interested in working with DrivenData! Currently, the team is looking for a software engineer who loves the idea of building Python applications for social impact. Apply Here! In this episode of DataFramed, a DataCamp podcast, Hugo speaks with Arnaub Chatterjee. Arnaub is a Senior Expert and Associate Partner in the Pharmaceutical and Medical Products group at McKinsey & Company. They’ll discuss cutting through the hype about artificial intelligence (AI) and machine learning (ML) in healthcare by looking at practical applications and how McKinsey & Company is helping the industry evolve. Tune in for an insider’s account into what has worked in healthcare, from ML models being used to predict nearly everything in clinical settings, to imaging analytics for disease diagnosis, to wound therapeutics. Will robots and AI replace disciplines such as radiology, ophthalmology, and dermatology? How have the moving parts of data science work evolved in healthcare? What does the future of data science, ML and AI in healthcare hold? Stick around to find out. In this episode of DataFramed, Hugo speaks with Cassie Kozyrkov, Chief Decision Scientist at Google Cloud. Cassie and Hugo will be talking about data science, decision making and decision intelligence, which Cassie thinks of as data science plus plus, augmented with the social and managerial sciences. They’ll talk about the different and evolving models for how the fruits of data science work can be used to inform robust decision making, along with pros and cons of all the models for embedding data scientists in organizations relative to the decision function. They’ll tackle head on why so many organizations fail at using data to robustly inform decision making, along with best practices for working with data, such as not verifying your results on the data that inspired your models. As Cassie says, “Split your damn data”. In this episode of DataFramed, Hugo speaks with Brian Granger, co-founder and co-lead of Project Jupyter, physicist and co-creator of the Altair package for statistical visualization in Python. They’ll speak about data science, interactive computing, open source software and Project Jupyter. With over 2.5 million public Jupyter notebooks on github alone, Project Jupyter is a force to be reckoned with. What is interactive computing and why is it important for data science work? What are all the the moving parts of the Jupyter ecosystem, from notebooks to JupyterLab to JupyterHub and binder and why are they so relevant as more and more institutions adopt open source software for interactive computing and data science? From Netflix running around 100,000 Jupyter notebook batch jobs a day to LIGO’s Nobel prize winning discovery of gravitational waves publishing all their results reproducibly using Notebooks, Project Jupyter is everywhere. Hugo speaks with Andrew Gelman about statistics, data science, polling, and election forecasting. Andy is a professor of statistics and political science and director of the Applied Statistics Center at Columbia University and this week we’ll be talking the ins and outs of general polling and election forecasting, the biggest challenges in gauging public opinion, the ever-present challenge of getting representative samples in order to model the world and the types of corrections statisticians can and do perform. Hugo speaks with Vicki Boykis about what full-stack end-to-end data science actually is, how it works in a consulting setting across various industries and why it’s so important in developing modern data-driven solutions to business problems. Vicki is a full-stack data scientist and senior manager at CapTech Consulting, working on projects in machine learning and data engineering. They'll also discuss the increasing adoption of data science in the cloud technologies and associated pitfalls, along with how to equip businesses with the skills to maintain the data products you developed for them. All this and more: Hugo is pumped! Hugo speaks with Allen Downey about uncertainty in data science. Allen is a professor of Computer Science at Olin College and the author of a series of free, open-source textbooks related to software and data science. Allen and Hugo speak about uncertainty in data science and how we, as humans, are not always good at thinking about uncertainty, which we need be to in such an uncertain world. Should we have been surprised at the outcome of the 2016 election? What approaches can we, as a data reporting community, take to communicate around uncertainty better in the future? From election forecasting to health and safety, thinking about uncertainty and using data & data-oriented tools to communicate around uncertainty are essential. Hugo speaks with Renee Teate about the many paths to becoming a data scientist. Renee is a Data Scientist at higher ed analytics start-up HelioCampus, and creator and host of the Becoming a Data Scientist Podcast. In addition to discussing the many possible ways to become becoming a data scientist, they will discuss the common data scientist profiles and how to figure out which ones may be a fit for you. They’ll also dive into the fact that you need to figure out both where you are in terms of skills and knowledge and where you want to go in terms of your career. Renee has a bunch of great suggestions for aspiring data scientists and also flags several important pitfalls and warnings. On top of this, they'll dive into how much statistics, linear algebra and calculus you need to know in order to become an effective data scientist and/or data analyst. Categorical Data in the Tidyverse, a DataCamp Course taught by Emily Robinson. Inference for Categorical Data, a DataCamp Course taught by Andrew Bray. Hugo speaks with Eric Colson, Chief Algorithms Officer at Stitch Fix, an online personal styling service reinventing the shopping experience by delivering one-to-one personalization to their clients through the combination of data science and human judgment. Eric is responsible for the creation of dozens of algorithms at Stitch Fix that are pervasive to nearly every function of the company, from merchandise, inventory, and marketing to forecasting and demand, operations, and the styling recommender system. Join for all of this and more. More Human Humans: how our work-life can be improved by ceding tasks to machines. Meet Tanya Cashorali, a founding partner of TCB Analytics, a Boston-based data consultancy. Tanya started her career in bioinformatics and has applied her experience to other industries such as healthcare, finance, retail, and sports. We’ll be talking about what it means to be a data consultant, the wide range of industries that Tanya works in, the impact of data products in her work and the importance of rapid prototyping and getting MVPs or minimum viable products out the door. How does Tanya balance the trade-off between rapid prototyping and building fully mature data products? How does this play out in particular cases in the healthcare and telecommunications spaces? How has her ability to do this evolved as a function of open source software development? We’ll also dive into how general data literacy has evolved, how it can help decision making in business more generally, the data science skills gap and how many data science hiring processes are broken and how to fix them. Hugo speaks with JD Long, VP of risk management for Renaissance reinsurance, about applications of data science techniques to the omnipresent worlds of insurance, reinsurance, risk management and uncertainty. What are the biggest challenges in insurance and reinsurance that data science can impact? How does JD go about building risk representations of every deal? How can thinking in a distributed fashion allow us to think about risk and uncertainty? What is the role of empathy in data science? Hugo speaks with Christie Bahlai, Assistant Professor at Kent State University, about data science, ecology, and the adoption of techniques such as machine learning in academic research. What are the biggest challenges in ecology that data science can help to solve? What does the intersection of open science and data science look like? In scientific research, what is happening at the interface between data science & machine learning methods, which are pattern-based, and traditional research methods, which are classically hypothesis driven? Is there a paradigm shift occurring here? Listen to find out! Hugo speaks with Yves Hilpisch about how data science is disrupting finance. Yves’ name is synonymous with Python for Finance and he is founder and managing partner of The Python Quants, a group focusing on the use of open source technologies for financial data science, artificial intelligence, algorithmic trading and computational finance. Why are banks such as Bank of America & JP Morgan adopting the open source data science ecosystem? What are the major sub-disciplines of Finance that data science is and can have a large impact in? How has the rise of data science changed the financial world and how the work is done and thought about? Stick around to find out. What are the biggest challenges in Pharmaceuticals that data science can help to solve? How are data science and statistics generally embedded in organizations such as Pfizer? What aspects of the pharmaceutical business run the gamut of nonclinical statistics? Hugo speaks with Max Kuhn, a software engineer at RStudio who was previously Senior Director of Nonclinical Statistics at Pfizer Global R&D. Max was applying models in the pharmaceutical and diagnostic industries for over 18 years. Hugo speaks with Derek Johnson, an epidemiologist with Doctors without Borders. Derek leverages statistical methods, experimental design and data scientific techniques to investigate the barriers impeding people from accessing health care in Lahe Township, Myanmar. If you thought data science was all machine learning, SQL databases and convolutional neural nets, this is gonna be a wild ride as to get the data for their baseline health assessments, Derek and his team ride motorcycles into villages in northern Myanmar for weeks on end to perform in person surveys, equipped with translators and pens and paper because they can’t be guaranteed of electricity. Derek also researches the factors associated with the transmission of hepatitis C between family members and has helped to conduct studies in Uganda, Nepal, and India. All this and more. how the different moving parts of data science have evolved over the past decade and in which direction they’re heading. You’ll see the impact that data science can have not only in tech, but also in such various verticals as retail, agriculture and the penal system. Taras will also take us through the 5 steps required to change organizations through data science, all of which are necessary. Can you guess what they are? We're really excited to have Taras on the show as DataCamp has had a long relationship with McKinsey, including that McKinsey uses DataCamp for training. What are best practices for organizing data science teams? Having data scientists distributed through companies or having a Centre of Excellence? What are the most important skills for data scientists? Is the ability to use the most sophisticated deep learning models more important than being able to make good powerpoint slides? Find out in this conversation with Jonathan Nolis, a data science leader in the Seattle area with over a decade of experience. Jonathan is currently running a consulting firm helping Fortune 500 companies with data science, machine learning, and AI. What are the biggest challenges currently facing data security and privacy? What does the GDPR mean for civilians, working data scientists and businesses around the world? Is data anonymization actually possible or a pipe dream? Find out in Hugo's conversation with Katharine Jarmul, a data scientist, consultant, educator and co-founder of KI protect, a company that provides real-time protection for your data infrastructure, data science and AI. Why are spreadsheets ubiquitous in data analytics, why are so many data scientists anti-spreadsheet? Join Jenny Bryan, a software engineer at RStudio & recovering biostatistician who takes special delight in eliminating the small agonies of data analysis, and Hugo to discover why spreadsheets are in fact necessary in data analytics and how spreadsheet workflows can be incorporated into more general data science flows in sustainable and healthy ways. Welcome to the future. Community building is an essential aspect of data science. But how do you do it? Find out in Hugo's conversation with Jared Lander, organizer of the New York Open Statistical Programming Meetup and the New York R Conference. Jared is also the Chief Data Scientist of Lander Analytics, a data science consultancy based in New York City and an Adjunct Professor of Statistics at Columbia University. How does Jared think about creating safe and welcoming spaces for budding and practicing data scientists of all ilk? How does he put this into practice? How does he make people feel comfortable and at home in a field in which so many intelligent and curious people feel like imposters? What practical & specific considerations are there in creating this home for underrepresented groups? How does he stay ahead of the curve in terms of modern, up-to-date content and speakers for his meetup and conference? "Cloud computing is a huge revolution in the computing space, and it's also probably going to be one of the most transformative technologies that any of us experience in our lifetime. " Paige Bailey, Senior Cloud Developer Advocate at Microsoft, in this episode of DataFramed. In this conversation with Hugo, Paige reports from the frontier of cloud-based data science technologies, having just been at the Microsoft Build and Google I/O conferences. What is the future of data science in the cloud? How can you get started? Stick around to find out and much, much more. What do online experiments, data science and product development look like at Booking.com, the world’s largest accommodations provider? Join Hugo's conversation with Lukas Vermeer to find out. Lukas is responsible for experimentation at Booking in the broadest sense of the word: from Infrastructure and Tools used to run experiments, Methodology and Metrics that help people make decisions to Training and Culture that help people understand what to do. They'll be talking about how Booking leverages Data Science to help empower people to experience the world through the three pillars of exploratory analysis, qualitative research and quantitative studies. They'll also take a deep dive into the fact that data science isn't actually anywhere near as objective as you may think. Building models of the world is dangerous and there are pitfalls everywhere, even down to the assumptions that you make. To find out about many statistical pitfalls, and how to build more robust data scientific models using statistical modeling, whether it be in tech, epidemiology, finance or anything else, join Hugo's chat with Michael Betancourt, a physicist, statistician and one of the core developers of the open source statistical modeling platform Stan. How can data science help in the fight against cancer? What are its limitations? Find out in this conversation from the frontier of research. Hugo speaks with Sandy Griffith from Flatiron Health, a healthcare technology and services company focused on accelerating cancer research and improving patient care. Sandy is Principal methodologist on Flatiron's Quantitative Sciences team and is tasked with leveraging data science "To improve lives by learning from the experience of every cancer patient". Anthony Goldbloom, CEO of Kaggle, speaks with Hugo about Kaggle, data science communities, reproducible data science, machine learning competitions and the future of data science in the cloud. If you thought that Kaggle was merely a platform for machine learning competitions, you have to check out this chat, because these ML comps account for less than a third of activity on Kaggle today. In the discussion: Kaggle kernels for reproducible data science and the evolution of the Kaggle public data platform; the genesis of Kaggle and how Anthony managed to solve the cold start problem of building a two-sided market place; the exciting implications of Kaggle's recent acquisition by Google for the future of cloud-based data science; why Python is dominant on Kaggle. "We should be looking at Automated Machine Learning tools as more like data science assistants, rather than replacements for data scientists" -- Randy Olson, Lead Data Scientist at Life Epigenetics, Inc. Randy specializes in artificial intelligence, machine learning, and created TPOT, a Data Science Assistant and a Python Automated Machine Learning tool that optimizes machine learning pipelines using genetic programming. Will the future of data science be automated? Which verticals will experience the largest disruption? What will the role of data science become? There's one way to find out: jump straight into this chat with Randy and Hugo. Michelle Gill, a deep learning expert at NVIDIA, an Artificial Intelligence company that builds GPUs, the processors that everybody uses for deep learning, speaks with Hugo about the modern superpower of deep learning and where it has the largest impact, past, present and future, filtered through the lens of Michelle's work at NVIDIA. Where is the modern superpower of deep learning most effective? Where is it not? Where should we channel our skepticism of the hype surrounding it? Sebastian Raschka, a machine learning aficionado, data analyst, author, python programmer, open source contributor, computational biologist, and occasional blogger, speaks with Hugo about the role of data science in modern biology and the power of deep learning in today's rapidly evolving data science landscape. How is Sebastian using deep learning to build facial recognition software that also prevents racial and gender profiling? Check out this week's episode to find out. Mara Averick, self-labelled data nerd and Tidyverse developer advocate at RStudio, speaks with Hugo about all things data: what it means to be a data nerd and how data science impacts all of our lives from thinking about toxicology to sports analytics to data for social good and civic tech; how can thinking about data make you a better citizen and how can we design computational interfaces to meet humans where they are? How we can help everybody access data relevant to them? Drew Conway, world-renowned data scientist, entrepreneur, author, speaker and creator of the Data Science Venn Diagram speaks with Hugo about how to build data science teams, along with the unique challenges of building data science products for industrial users. How does Drew now view the Venn circles he created, those of hacking skills, mathematical and statistical knowledge and substantive expertise, when building out data science teams? How can data science be leveraged to inform business decisions around all the text data that businesses have and what can text mining all the open text data out there tell us about society? For example, what can analyzing film scripts tell us about gender dynamics in Hollywood? Join Julia Silge, data scientist at Stack Overflow, as she takes a deep dive with Hugo into data science, the written word, text mining and natural language processing. Nuclear engineering, data science and open source software development: where do these all intersect? To find out, join Hugo and Katy Huff, Assistant Professor in the Department of Nuclear, Plasma, and Radiological Engineering at the University of Illinois where she leads the Advanced Reactors and Fuel Cycles research group. How does data science help Buzzfeed achieve online virality? What type of mass online experiments do data scientists at BuzzFeed run for this purpose? What products do they develop to make all of this easy and intuitive for content producers? Find out about all of this and more in this episode when Hugo talks with Adam Kelleher, Principal Data Scientist at BuzzFeed and Adjunct Assistant Professor at Columbia University. They'll also dive into the role of thinking about causality in modern data science. Air pollution, the environment and data science: where do these intersect? Find out in this episode of DataFramed, in which Hugo speaks with Roger Peng, Professor in the Department of Biostatistics at the Johns Hopkins Bloomberg School of Public Health, co-director of the Johns Hopkins Data Science Lab and co-founder of the Johns Hopkins Data Science Specialization. Join our discussion about data science, it's role in researching the environment and air pollution, massive open online courses for democratizing data science and much more. Etsy, online experiments and data science are the topics of this episode, in which Hugo speaks with Emily Robinson, a data analyst at Etsy. How are data science and analysis integral to their business and decision making? Join us to find out. We'll also dive into the types of statistical modeling that occurs at Etsy and the importance of both diversity and community in data science. Jake VanderPlas, a data science fellow at the University of Washington's eScience Institute, astronomer, open source beast and renowned Pythonista, joins Hugo to speak about data science, astronomy, the open source development world and the importance of interdisciplinary conversations to data science. Airbnb's business depends on data science. In this episode, Hugo speaks with Robert Chang, data scientist at airbnb and previously at twitter. We'll be chatting about the different types of roles data science can play in digital businesses such as airbnb and twitter, how companies at different stages of development actually require divergent types of data science to be done, along with the different models for how data scientists are placed within companies, from the centralized model to the embedded to the hybrid: can you guess which is Robert's favourite? This is a hands-on, practical look at how data science works at airbnb and digital businesses in general. Chris Volinsky, AT&T Labs' Assistant Vice President for Big Data Research and a member of the team that won the $1M Netflix Prize, an open competition for improving Netflix' online recommendation system, speaks with Hugo. We'll be discussing the role data science plays in the modern telecommunications network landscape, how it helps a company that services over 140 million customers and what statistical and data scientific techniques his team uses to work with such large amounts of data. Along the way, we'll dive into the need for more transparency concerning the use of civilian data and Chris's work on the Netflix recommendation system prize. Claudia Perlich, Chief Scientist at DStillery, a role in which she designs, develops, analyzes and optimizes the machine learning algorithms that drive digital advertising, speaks with Hugo about the role of data science in the online advertising world, the predictability of humans, how her team builds real time bidding algorithms and detects bots online, along with the ethical implications of all of these evolving concepts. The trucking industry is being revolutionized by Data Science. And how? Hugo speaks with Ben Skrainka, a data scientist at Convoy, a company that provides trucking services for shippers and carriers powered by technology to drive reliability, transparency, efficiency, and insights. We'll dive into how data science can help to achieve such a trucking revolution, and how this will impact all of us, from truckers to businesses and consumers alike. Along the way, we'll delve into Ben's thoughts on best practices in data science, how the field is evolving and how we can all help to shape the future of this emerging discipline. Maelle Salmon, a data scientist who has worked in public health, both in infectious disease and environmental epidemiology, joins Hugo for a chat about the role of data science, statistics and data management in researching the health effects of air pollution and urbanization. In the process, we'll dive into the continual need for open source toolbox development, open data, knowledge organisation and diversity in this emerging discipline. David Robinson, a data scientist at Stack Overflow, joins Hugo to speak about the evolving importance of citizen data science and a future in which data literacy is considered a necessary skill to navigate the world, similar to literacy today. We'll speak about many of Dave projects, including his analysis of Trump's tweets that demonstrated the stark contrast between Trump's own tweets and those of his PR machine. We'll also speak about ways for journalists, software engineers, scientists and all walks of life to get up and running doing data science and analysis. Hilary Mason talks about the past, present, and future of data science with Hugo. Hilary is the VP of Research at Cloudera Fast Forward, a machine intelligence research company, and the data scientist in residence at Accel. If you want to hear about where data science has come from, where it is now, and the direction it's heading, you've come to the right place. Along the way, we'll delve into the ethics of machine learning, the challenges of AI, automation and the roles of humanity and empathy in data science. We are super pumped to be launching a weekly data science podcast called DataFramed, in which Hugo Bowne-Anderson, a data scientist and educator at DataCamp, speaks with industry experts about what data science is, what it’s capable of, what it looks like in practice and the direction it is heading over the next decade and into the future. Check out this snippet for a sneak preview!